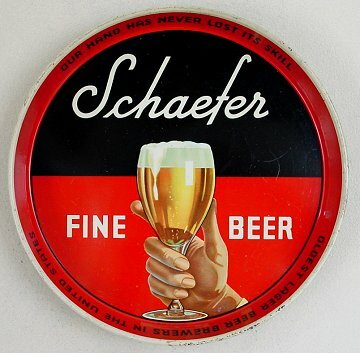 "Our Hand Has Never Lost Its Skill"
"Finest Lager Beer Brewers in the United States"
F & M Schaefer Brewing Co.
Brooklyn, NY Comments: This is by far the most common of the Stock version of this fine looking tray. Here is a comparison of three of the five. The one not in my collection yet is the Metzger. This is a very sharp tray when it is clean.